I awoke to a very dismal morning, not the best news when you're on the hunt for a decent sunrise. My plan was to head for Peveril Point in Swanage, to document the beginning of a glorious new day, but as I arrived at the car park on the eastern tip of the town, it started to hammer it down, so I sat and waited patiently for it to subside, which in due course it did. So gathering up my stuff, I began to set off on the 10 minute walk to the coast, but after a few steps I thought better of it, as it began to lash it down once more. I realised that even if I waited for this shower to clear, if the rain insisted on a repeat performance, particularly one with a bit of longevity to it, which seemed prodigiously feasible. Once I was down at the point, I and my gear were going to get a thorough drenching. I needed somewhere with a bit of shelter, where I could cower and hide should the weather mount a sustained attack. The view from my little window to the world. I decided to head down to the sea front, where thanks to the huts that line one end of the beach, there would be a place for me to skulk should the worst happen. I parked up and, now that the rain had abated yet again, walked along to a suitable groyne, which would provide an appropriate piece of coastal foreground furniture, and set up on the beach. I managed to get a couple of shots before the rain began yet again, softly at first, but it took no time at all in working up quite the head of steam, lacerating rain, peals of thunder and accompanying flashes of lightening darted through the broiling sky. Needless to say, by the time the first drops of rain had pitted the sand about me, I had already scampered gazelle like to the nearest beach hut, being the hardy soul that I am. This it turned out would be my spot for the rest of my morning there, as the rain did not let up a single spot. It actually looks quite peaceful in these shots, but it was actually heaving it down. My selection of shots were not exactly varied, as I was working in a space of around 5 x 3 feet, but thankfully the sky did manage a bit of interest. A few rays of sunlight managed to peep through the infrequent gaps in the fluctuating cloud cover, and as I had very little else to divert my attention, I was ready for them when they did. After a while the sky completely shrouded itself in a soupy haze, and I was forced to trudge my way soggily back to the car, before returning to the house for some breakfast. Once that was taken care of, I drove to Poole and hopped aboard the boat to Brownsea Island. It is the largest of the eight islands that reside in Poole Bay, and apart from a few buildings, the entire island is owned by the National Trust, and is given over to woodland (pine and oak), heathland and salt-marsh, it is also a designated a Site of Special Scientific Interest. Interestingly, Brownsea Castle is leased to the John Lewis Partnership for use as a holiday hotel for staff, and is not open to the public. Well OK, semi-interestingly. displaying their plumage, wrong time of year I guess. well it was interesting to me. You don't have to look through them all, there won't be a test or anything. Pine woodland with a fern carpet and fresh evergreens in the background. A stand of towering trees. 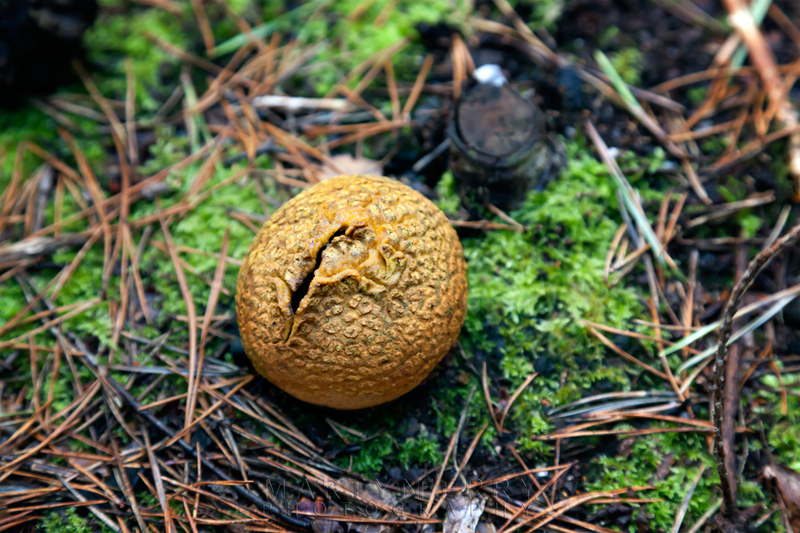 I spotted quite a few of these fungal balls on the woodland floor. Pines and a White Birch tree. The soft sunlight made these leaves glow. There were a few of these buzzing around and old tree trunk. Came across this fellow strung up between two trees. This pine cone was on a fallen tree and had become residence for a couple of opportunist mushrooms. A Silka Deer relaxes in the late afternoon sunshine. The island is only 1.5 miles long and 0.75 miles wide, but it’s so picturesque, with such an array of little paths running through the dense, fern carpeted woodland, that it’s easy to lose track of time and just keep walking. There is always that tantalising anticipation of stumbling onto yet another scenic view through the trees, that it keeps drawing you onward. Plus, Brownsea is home to one of the few places in southern England where indigenous red squirrels survive, largely because non-native grey squirrels have never been introduced to the island. And I’m pleased to say, I saw a couple, the first I think I've ever seen, so that pleased me a great deal. At the end of the day I had certainly walked far more than 1.5 miles, at least that’s what my feet were telling me by the time I got back on the boat for the short return ride to Poole. Once I’d been reunited with my car, and realised I was supposed to pay for parking, but thankfully had not got a ticket, which also pleased me a great deal, I was on my way back to that old favourite, Corfe Castle. Looking over to Poole from the island shore. I decided to head up West Hill for sunset, as even though the sun would be setting behind me, which meant I wouldn’t get the whole sunset cloud experience, I hoped the warm light of the golden rays would light up the ruins and make the endeavour worthwhile. Plus I had done the East Hill view before on a previous trip, and I fancied trying out another perspective at that time of day. After struggling up the murderously steep incline to the top of the hill, which really was quite the effort, and made me feel very out of breath. And once I’d taken a moment to suitably compose myself, which mainly consisted of collapsing to my knees, clawing at the grass and issuing keening sobs, between lungfuls of air, about how I was just too young to to die, I was soon back to my usual chipper self. Evening sunlight drapes itself over the undulating countryside. Looking around from this vantage point, I could see plenty of the landscape below me suffused with an auriferous light, as it poured from the falling sun. Unfortunately the sky was home to multitude of clouds, so the early evening glow was rather haphazard in its illumination of the land. And more importantly none it was falling on the ruins or the village below. Thankfully I managed to capture the fleeting light as it hit the ruins and village, as it did not return. I spent over an hour on that lofty perch, contending with a non-stop buffeting from the chilly wind, intermittent rain showers that I can only describe as vicious, and absolutely no shelter to be had from any of it. For my troubles, I was rewarded with a scant three minutes of sunshine on the village and a portion of the castle, which left me feeling a tad put out to be honest. It was obvious the clouds were letting me know who was boss, and I should keep my disagreeable views on their behaviour to myself next time. The final shot of the day caught a bit of colour in the clouds. Once the light had faded, I made my way down the hill and returned to the house for some dinner, a place to dry out and warm up, and to lick my wounds.